Fridges and couches and trash -- oh my. The WTOP Traffic Center kept a running tally of all reported road debris on Washington-area highways for a full year, and some of them are quite unusual. What's a farm haybell feeder exactly? WASHINGTON — There’s nothing quite like the sensation of seeing a farm haybell feeder or a refrigerator skidding toward you while driving at highway speed. Yet this scenario played out for several local drivers over the past year. The WTOP Traffic Center kept a running tally of all reported road debris on Washington area highways for a full year. The reports came primarily from WTOP listeners, in addition to local police and transportation agencies. Of the hundreds of man-made objects spotted since last August, the most common form of debris by a landslide came in the form of wheels, tires and large tire tread. Visit WTOP’s Traffic Center for the latest updates. Visit WTOP’s Weather Center for the latest forecast. Sign up for WTOP Alerts and download the WTOP app to stay informed. The next most-common object dropped on area highways was ladders. There were more than two dozen reports of ladders, many of which were struck by passing vehicles. The AAA Foundation for Traffic Safety said road debris was a factor in more than 200,000 police-reported crashes across the country from 2011 to 2014. Two in three debris-related crashes result from things falling from a vehicle due to improper maintenance or an unsecured load. 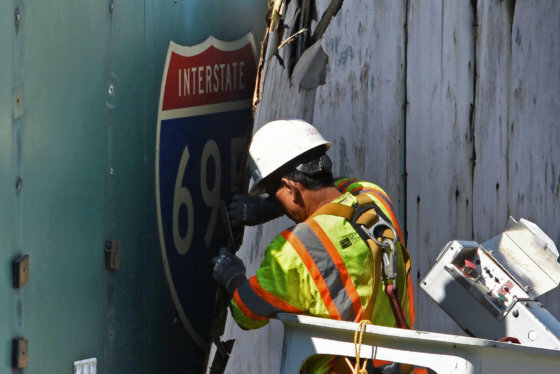 Work began Thursday on the Interstate 66 Potomac River Freeway, uncovering a roadside relic and evoking memories of an ambitious and contentious era in highway design. Pieces of metal and furniture tied for third place locally. It is possible that some of the reports of metal were ladders that had been struck and deformed beyond recognition. Of the dozens of furniture sightings, more than a third were couches or sofas. Other forms of furniture included dressers, tables and stools. Several reports included multiple items of furniture. There were also 14 reports of rolled-up carpet, rugs and tarps. Just under two dozen reports of trash, trash bags or trash cans were called in to the Traffic Center, and as many reports of wood debris. Many of the reports of wood were broken pallets, presumably from commercial vehicles. There were only 21 reported mattresses or box springs in travel lanes, and nearly two dozen large dirt and gravel spills. Several refrigerators fell onto area highways over the past year. 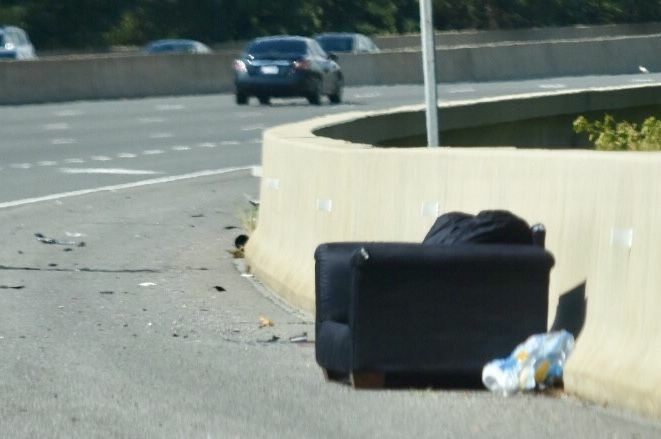 Two dishwashers were spotted in the middle of highway lanes — one on Interstate 66 near Nutley Street, another on the Beltway near Little River Turnpike. A microwave fell into the right lane of the Outer Loop near the Baltimore-Washington Parkway about a week ago. Some of the most obscure items area drivers swerved around included gym equipment, a pineapple, Christmas trees, porta-potties and even a farm haybell feeder. Most of the debris reports received were unspecified, as callers were unable to discern what the object was when driving by. Trees, tree limbs and roadkill were not included in the list. Miscellaneous debris ranged from car parts to poles and pipes. Pulverized bits of plastic and glass from crashes were generally excluded from this tally unless the debris was large enough to be considered a hazard or physically impeded traffic. Over the past five years, the Maryland Department of Transportation State Highway Administration said it has spent an average of $1.85 million on debris removal statewide. It is difficult to quantify just how much debris actually fell onto D.C. roads. Many items likely went unreported to local officials and the WTOP Traffic Center, and the list is only, at best, an approximation of the total amount of debris spilled. The list of debris was compiled using a proprietary application that organizes and catalogs traffic incidents for the WTOP listening area. The database is updated around the clock, seven days a week. If you see a hazardous object in a travel lane on an area highway, dial #77 or call the WTOP Traffic Center at 866-304-WTOP (9867).